Chilean writer-director Pablo Larraín completes his Pinochet triolgy with a movie that is as hilarious as it is important. Larrain shows us how the right-wing dictator Pinochet fell from power when he caved to international pressure and called a referendum on October 5th 1988 allowing Chileans to vote on whether he should or shouldn't stay in power. Of course, Pinochet thought he couldn't lose - internalised repression and self-censorship would lower voter turn out to a handful of yes voters. And, after all, he was only giving the opposition 15 minutes of airtime a day to broadcast their message - one he was sure would be earnest and pious and, effectively a "turn-off". 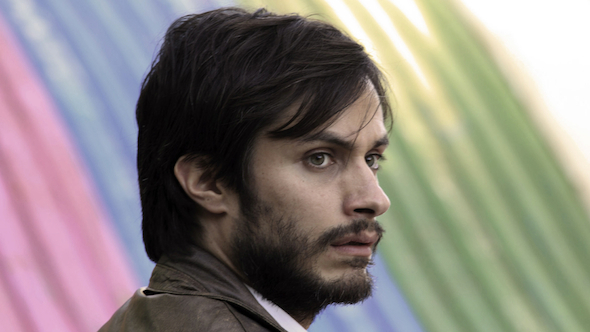 This movie tells the story of the ad execs, symbolised by Gael Garcia Bernal's Rene, who radically decided not to tell voters about the disappeared, the tortured and the murdered, but to give them a vision of the happy, free future they could have. Rene uses the language of US TV commercials to paint a future as optimistic and cheesy as a Coca-Cola commercial, complete with catchy jingles and rainbow logos. This horrifies the long-suffering socialists, but actually works, much to the chagrin of Rene's business partner, who starts working on the Yes! campaign and spoofing his No! campaign ads. What I love about this movie is how it takes a kind of sideways approach to a major historical event, and so gives us a unique perspective. As the director said in the LFF Q&A, Pinochet was, in a sense, hoist by his own petard. He had forced modern consumer capitalism onto Chile, and was ultimately brought down by the crass advertising and consumer culture that he had unwittingly created. Bernal's Rene is also an enigmatic and charismatic central figure. He starts off unwilling to get involved in the campaign, but slowly warms to the cause, almost in spite of himself. In the final scene, as we see him return to pitching cheesy TV spots, he looks dissatisfied with the work he used to enjoy - as if he realises he'll never pitch a campaign of such importance again. Technically, this film is a tour de force. Larrain deliberately shoots his footage as retro video: grainy, slightly out of focus, clumsily lit, with glare on the lens. What this does is allow him to seamlessly incorporate the real vintage footage of the TV spots, and Pinochet, and the crowds celebrating in the streets. For the audience, the result is utterly immersive and authentic. And also hilarious - earnest footage of Hanoi Jane urging the Chileans to vote No! Kudos to all involved. NO played Cannes 2012, where it won the CICAE Award, Locarno, New York and London. It was released earlier this year in Chile and opens in New Zealand on Jan 31st and in the UK on Feb 8th. The running time is 118 minutes.